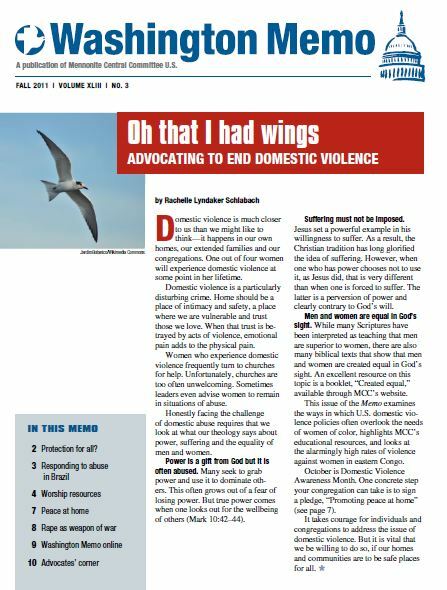 This issue of the Washington Memo explores the topic of domestic violence, which is much closer to us than we might like to think—it happens in our own homes, our extended families and our congregations. One out of four women will experience domestic violence at some point in her lifetime. Domestic violence is a particularly disturbing crime. Home should be a place of intimacy and safety, a place where we are vulnerable and trust those we love. When that trust is betrayed by acts of violence, emotional pain adds to the physical pain. Honestly facing the challenge of domestic abuse requires that we look at what our theology says about power, suffering and the equality of men and women.